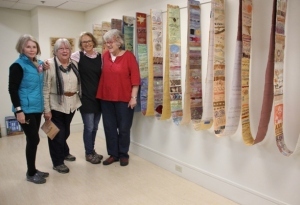 A stunning show titled Breaking Patterns, by the Artist’s Way Collective (AWC) from Annapolis County, officially opened with a reception Friday, November 7 at the AGNS Western Branch. It was on exhibit until February 28. 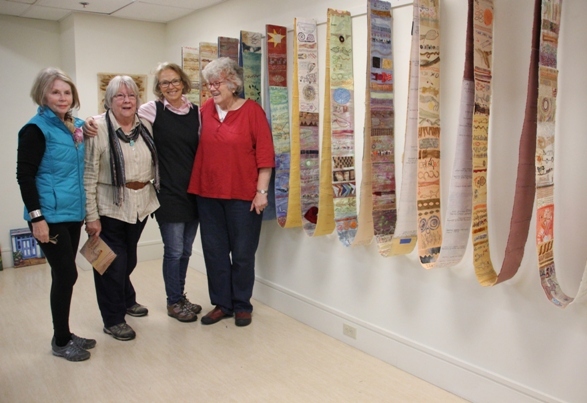 The AWC had its beginnings in 2012 when a group of artists in Annapolis County began meeting weekly to discuss The Artist’s Way, a book about creativity written by Julia Cameron. They have been doing joint exhibitions since then. The challenge they gave themselves for this new exhibit in Yarmouth was to stretch their artistic skills by going beyond their usual individual approaches. In so doing, they focused on the saying, “When patterns are broken, new worlds emerge,” words that originated with Tuli Kupferberg, American counterculture poet, author, cartoonist, pacifist anarchist, publisher and co-founder of the band The Fugs. With this quote in mind, the group created the pieces that will be on exhibit. One is a collaborative effort—a large mosaic-style installation made up of multiple canvasses painted by each artist. While the size and number of canvasses was set by the group, each artist was free to use various colours and styles. 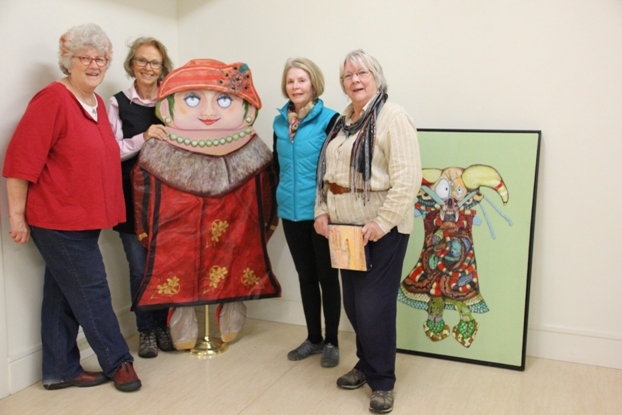 In addition to the collective installation, each artist will exhibit an individual array of work ranging from oils, pen and ink, pastels, watercolours, fibre, acrylics and collage. The five artists will be present at the opening reception. This free event is sponsored by the Friends of the AGNS Western Branch Society with the generous support of Coastal Financial. This entry was posted in Exhibits - Community Room. Bookmark the permalink.